Everyone experiences a loss by death differently. 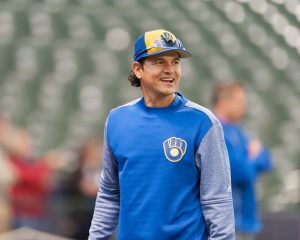 For Milwaukee Brewers’ first base coach, Carlos Subero, the death of his father at the young age of 46 in 1995, sent him searching deeper into God’s Word. It was the death of his father that brought Carlos to his knees to accept Jesus Christ as his Savior and Lord. The Subero family moved back to Venezuela. When Carlos enrolled in his 6th grade, the school promoted him to 7th grade because the American education he received in Kansas made it possible for the advancement. Carlos attended Gran Columbia High School in Caracas and graduated when he was 15 years old. The path to the major leagues was long and hard. When Carlos graduated from high school at 15 years old, he had a decision to make: go to college or play ball. His mother encouraged him to go on to college, but Carlos asked if she would give him three years to sign professionally or he will attend Central University of Venezuela. He was already accepted to the University. “I had to practice hard before going to tryouts,” states Carlos. “I had three surgeries on my throwing elbow which set me back year after year. My mom said to me, ‘Carlos, be honest, you had three surgeries, two pins and wire in your throwing elbow. You should go to college.’ But I asked for another month and a half.” Then, on November 5, 1990, Carlos signed, at 19 years old, a free agent contract with the Kansas City Royals. He played five seasons in the minor leagues with Kansas City, Pittsburgh Pirates, and Texas Rangers. He also played a year of independent league baseball. After he decided to hang up his spikes, Carlos began coaching in the Rangers organization. Two years later he began his 15 year managerial stint. 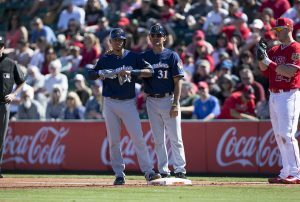 Beginning the 2016 season, Carlos finally made it to the major leagues as the first base coach and infield/baserunning coach with the Milwaukee Brewers. When Carlos began this ministry, they partnered with Athletes in Action (AIA) when AIA brought teams to Venezuela to play ball and share their Christian faith with our players and adults. The Venezuela Christian Athletes Foundation has partnered with other sports ministries as well. Very moving story Mr. Darnall. Thank you so much for showing how God can use pain for our ultimate good, even if (and especially when) it doesn’t feel like it. Previous post: Is Torben Sondergaard And The Last Reformation Biblical? Next post: How Can Studying Prophecy Be Bad?